Did you ever watch a movie or television program and wonder what goes on behind the scenes? Warner Bros. Studio Tour in Los Angeles gives visitors an opportunity to find out. For more than 75 years, Warner Bros. has been making movies at their Burbank studios, and they generously share their heritage with visitors. Unlike the tarted-up studio tour at Universal, little on the Warner Bros. tour is scripted or set up just to wow visitors. The one exception is part of the Friends television show set, which was relocated to a small room near the prop department so that visitors could enjoy it. Some walking is required, and you'll get on and off the tram several times. Adults must bring legal photo identification, and you will have to show it at the ticket counter. Children under 8 are not allowed. Anyone between 13 and 17 years old can take the tour on their own, but an adult must check them in. Children under 12 must have an adult take the tour with them. This information is different than what you may find elsewhere online and it's always best to check their website before you go in case of changes. Plan on arriving at least 20 minutes before your scheduled tour departure. Arriving early will allow time for parking and security. Leave your video camera in the car. Still, photographs are allowed in some parts of the tour. Do not bring large bags like backpacks or suitcases, or anything that might be considered a weapon (including pocket knives and mace or pepper spray). Be prepared to be checked by a metal detector and have your personal belongings inspected. If you're visiting several Hollywood attractions on the same day, you can save money on the Paramount Tour with a Go Card. Besides the basic tour described below, Warner Bros. offers an expanded tour or two that cover more areas, go into more depth and may include lunch in the commissary. Visit their website to find out about these options if you're interested. The deluxe tour experiences may also have a higher minimum age requirement. The name of this tour changes from time to time, but most recently it was called the VIP Tour. The reception center shows a short film highlighting Warner's history. Visitors travel in groups of twelve or less in an open-air tram. The tour varies, but you may see the Costume Department, Scenic Department, sound stages, editing rooms, screening theaters, and the 2-million-gallon tank used for filming water scenes. 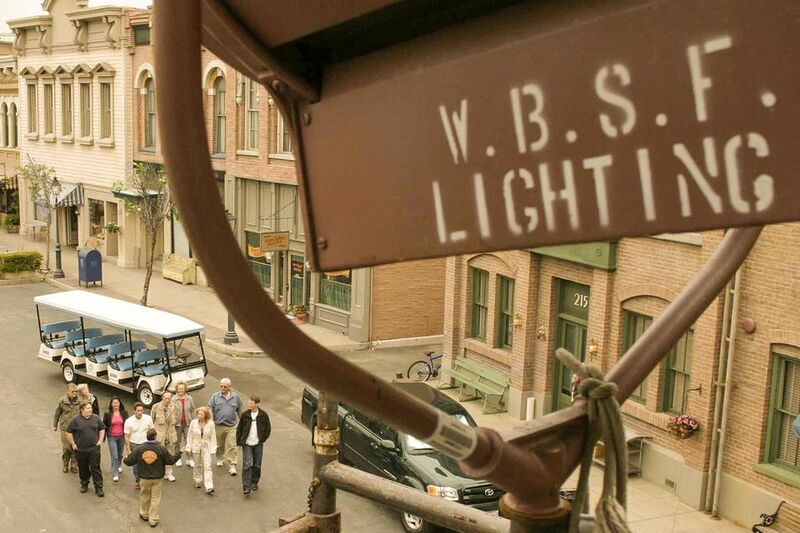 Some parts of the Warner Bros. Studios are off-limits to photography, such as the sound stages where movies and television shows are filmed. The tour guide will stow your cameras in these areas. Tours usually visit at least one or two filming sets, usually for television series. Which sets depend on filming schedules. The tour visits some of the studio's twenty acres of exterior sets. It's in this area where most of the picture taking are allowed. This is also where the tour guides shine, showing visitors spots such as the scene of Spiderman and Mary Jane's first kiss. They'll also take you behind the facades, building fronts made just for show and into a "practical" set, which has rooms inside. Even though only a small portion of the studio's memorabilia collection is on display in the Studio Museum, you'll probably still be looking around at the costumes, scripts, props, and letters when your tour guide says it's time to leave. Vigilant guards keep itchy hands off the treasures, and very little is behind glass so that you can see it all clearly. Once you've been on the studio tour, you'll never think of a movie or television program in quite the same way again. We rate the Warner Bros. Studio Tour 4 stars out of 5. It's an authentic tour of a working studio unfettered by special effects, and the museum is excellent. Tours are available on weekdays year-round (when you'll find more things going on) and weekends during summer vacation time. Check the current schedule before you go (not required but highly recommended). Open spaces are sold on a first-come, first served basis. There is an admission fee charged (expensive) and parking is extra. The basic tour lasts a little more than two hours, the expanded tour options last longer. Any time is a great time to visit. Parking is in a visitor lot near Gate N which is located across from the above address. A parking fee is charged. Driving directions from all the Los Angeles freeways are available at the Warner Bros. website.